On December 23, 1867, Sarah Breedlove, better known as Madam C.J. Walker, was born in Delta, Louisiana. Walker became the first woman self-made millionaire in the United States. Madam C.J. Walker was the first American woman to make a million dollars. She did it through a lot of hard work and savvy marketing of cosmetics products, such as this "Wonderful Hair Grower." On December 23, 1867, Sarah Breedlove was born in Delta, Louisiana. As an adult, Breedlove took the name “Madam C.J. Walker” to form the Walker Manufacturing Company. Madam C.J. Walker was one of the first women to be a self-made millionaire in the United States. The Walker Manufacturing Company manufactured, marketed, and sold a wide variety of cosmetics and beauty products. 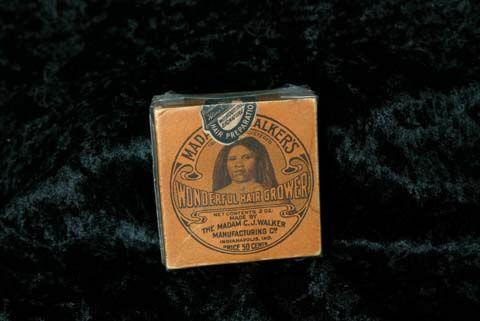 The company is best known for its array of hair-care products for African American women like Walker herself. Walker was a smart businesswoman and shrewd marketer. To stop other businesses from copying her products, she placed her own photo on every product her company produced. She also established a business training college—Leila College, named after her daughter—that taught women how to sell Walker products and start their own Walker franchises. By providing entrepreneurial training for African American women, Walker was able to expand her customer base and help empower other women. substances applied to the body to make it appear more attractive. consumer, or someone who buys something. licensed group of connected works, such as films, books, and video games. to control or organize a situation or activity. to guarantee, or make safe and certain.